This composition increased the length of the perimeter of the building and created shallow floorplates. This meant more natural light could flood into the building, placing many treatment spaces next to windows which made the most of the views out over the surrounding landscape as well into the internal courtyards created in between the hospital’s wings. Nelson Mandela launched the Sheppard Robson and John Cooper Architecture (JCA) competition winning design for a new specialist children’s hospital in Johannesburg, South Africa on July 31st 2009. Speaking at the launch, Nelson Mandela, who turned 91 on July 18, said the hospital was badly needed on a continent where millions do not live to see their fifth birthday: “This is not a luxury but a vital necessity that can no longer be delayed”. The Sheppard Robson and JCA hospital design was developed with local architect Gapp and Ruben Reddy and won in an international design competition. 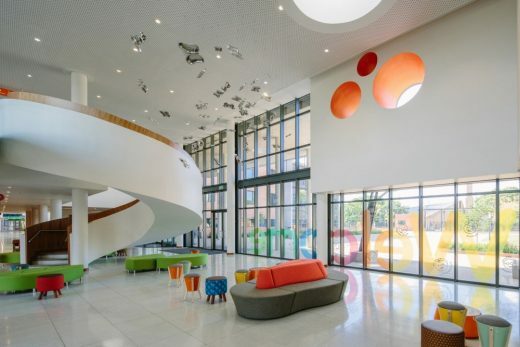 It will be a modern state-of-the art paediatric tertiary facility located on the Wits education campus in Parktown, Johannesberg – a central position allowing it to service the needs of the region’s populations. The hospital will be a 200-bed, 8 theatre facility, with state-of-the-art diagnostics, with future plans for expansion to 300 beds. 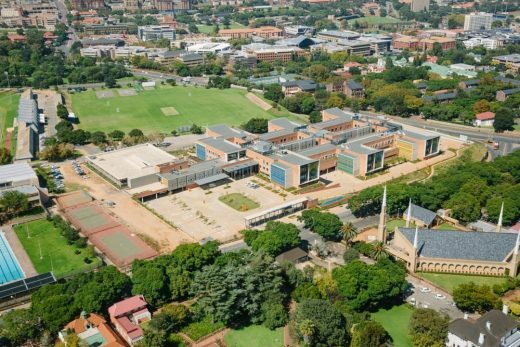 It will operate in partnership with the Wits medical school as a primary base and will engage all medical training facilities across the region. The design centres around a secret garden – a visual and spiritual heart – around which all activity is based. 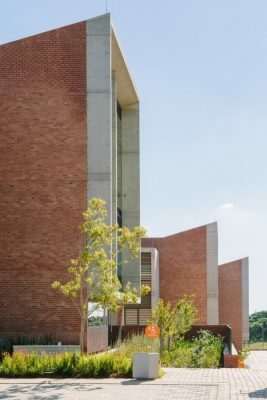 The shallow floor plans enable much of the building to be naturally lit and ventilated with daylight concentrating into all areas – a highly sustainable design employing passive energy principles and exploiting the opportunity to use local labour and materials. Construction of the rands1 billion (about $800 million) hospital will begin in late 2010 and is expected to be completed in 18 months. Mandela was jailed for 27 years for his fight against apartheid. He became South Africa’s first black president in 1994 and stepped down after serving one term in 1999. Since then, he has devoted himself to causes such as fighting AIDS and poverty and championing the rights of children. Sheppard Robson and John Cooper Architecture recently formed an association to work together on large and complex health care projects. Experts in design, delivery and health care architecture, the principals provide a levelof thought leadership which is the equal of any in the UK. The design and delivery resources at Sheppard Robson have secured and maintain a client list of major companies, institutions and public bodies in the UK and internationally. The practice has worked on many healthcare projects, the most celebrated of which is the Chelsea and Westminster Hospital in London, UK. In fields allied to healthcare, the practice has developed an expertise and a track record in the design of research and academic buildings for leading universities and teaching hospitals in the UK. John Cooper Architecture brings a proven track record of leading the design and construction of innovative and complex hospital projects. Established 70 years ago, Sheppard Robson has undergone an evolution with each new generation of partners, however the guiding principles on which it was founded remain the same: Innovation, Sustainability and Social Conscience. This has enabled the practice to develop and maintain its position as one of the UK’s largest architectural practices over the last twenty years. Today, Sheppard Robson has over 350 architects, designers, technicians and support staff in offices in London, Manchester and Glasgow, and is working in the Middle East and Asia. We believe our people are our most valuable asset and strive to create and maintain a learning organisation that offers the opportunity to grow and develop their skills. 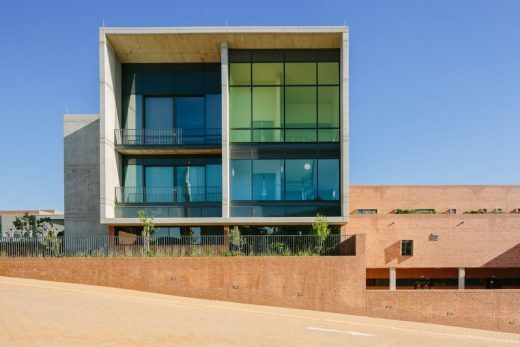 Our projects cover a diverse range of building typologies: Healthcare, Schools, Colleges, Universities, Offices, Headquarters, Interiors (ID:SR), Residential, Science, Retail, Hotels and Arts and Cultural buildings. John Cooper Architecture was founded in 2009 by John Cooper, who has been a principal in practice for 28 years with Avanti Architects for which he was a founding member and Anshen+Allen, where he was the co-leader of healthcare in their London office. During his leadership at Anhen+Allen, London, the practice designed three major children’s teaching hospitals and four further new hospitals with significant paediatric components. JCA is already working on a number of hospital projects in the UK and offers a very experienced and innovative core of healthcare designers and planners. John Cooper Architecture is committed to innovation and humanising the design of healthcare facilities and is developing an architecture which is genuinely international, incorporating the best of European, US and southern hemisphere design. In 2005, the NMCF identified an urgent need to develop a dedicated paediatric hospital servicing the SADC region. There are only two hospitals on the African continent specifically dedicated as tertiary and quaternary referral paediatric facilities. 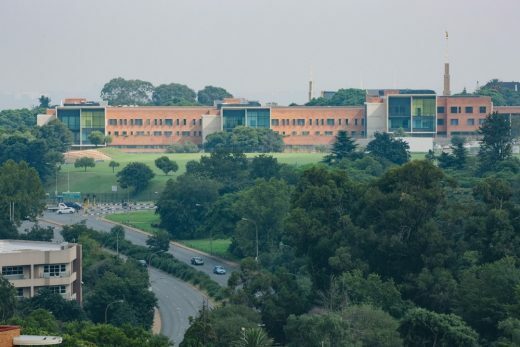 South Africa’s only dedicated paediatric hospital, the Red Cross Children’s Hospital (“RCCH”), mainly serves the Western Cape region of South Africa. Compared to, for example, 23 children’s hospitals in Canada, 19 in Australia and 20 in Germany, the plan to establish a second health facility for a population of 20,8 million children in South Africa is a small, but necessary, step towards providing much needed paediatric care on the continent. There has been a decline in the population of qualified paediatric healthcare professionals in South Africa. The need to establish a centre of excellence in paediatric sub-speciality training is paramount to increasing the human resource capacity of the region to treat the population adequately across all levels of care. This may also encourage the return of the many specialists that have left the region over the last few years. Driven by his love for children and a desire to end their suffering, former President Mandela established the Nelson Mandela Children’s Fund (NMCF) in 1995. From 1996 to 1998, NMCF successfully mobilized over R36 million to fund over 780 projects, at an average of R40, 000 per project. Grounded in the legacy of its founder, NMCF initially operated as a grant-making organization promoting a humanitarian response to the plight of South Africa ‘s children and youth. The 1995-1999 period was characterised by ad hoc funding strategies that enabled children and families to meet immediate needs, and one-time support for overhead and salary costs for organisations targeting children’s issues, with no particular programmatic basis for NMCF’s engagement with these organisations.